As a financial planner, I’ve watched countless clients launch successful retirements after years of hard work and lots of careful planning. One thing I’ve learned from this experience is that a good retirement requires more than money. It requires a certain mindset – a determination to live in the present, enjoy life and embrace joy. 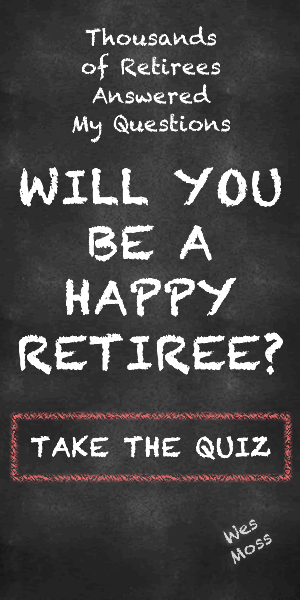 The happiest retirees I know – regardless of how much money they have or how they spend their days – share that attitude, and these 10 resulting behaviors. Live Healthy – Without your health, you’ve got nothing. Stay in shape, eat right, get your sleep and check in with your doctor on a regular basis. These habits will help you avoid illness, give you more energy, and make you feel generally better than your couch potato friends. Enjoy Your Money – You won! Your effort and discipline has funded retirement as you envisioned it. Now is the time to savor the fruits of a lifetime’s work. Be prudent, of course, but don’t be cheap with yourself. Do the things you’ve always wanted to do – travel, restore a ‘67 Mustang, build that cabin in the mountains. Remember, you can’t take it with you. Cherish Your Loved Ones — Show your love by spending time with them. Express your affection in words and deeds. Make the occasional grand romantic gesture like you did when you were a smitten 25-year-old. Pursue Your Hobbies – Remember when you wished you could spend all day on your favorite pastime or passion project? Well, now you can! You can also take up new activities or interests. Taking on fresh challenges is a proven way to strengthen the mind as we age. Live in the Now – Never let the phrases “Back in the day” or “In my time” pass your lips. This IS your time. Embrace it. Stay Social – Get out and mix it up with people. Accept invitations to weddings and other events, go visit a friend, meet the girls for coffee at a restaurant, organize a card game with your couples friends. Run with the Right Crowd – Sadly too many older folk turn bitter. Avoid them. Hang out with positive people. They will lift you up and brighten your days. Stay Informed – You have a huge stake in what’s happening in the world. Follow the news, work to understand the issues. Get involved if you are so inclined. Don’t dismiss digital technology or the world will pass you by. Use email and consider getting on Facebook, or some other social network. Laugh – Why wouldn’t you? You have the world by the tail. Find humor in the ultimately meaningless trial and troubles of your everyday life. Don’t’ Let Them Wear You Down – Ignore the disapproval and judgment of others. You’ve lead an amazing life full of good and bad, achievement and disappointment, sadness and joy. You’re writing a new chapter, and let the critics and eye-rollers be damned. That tattoo is gonna look awesome!